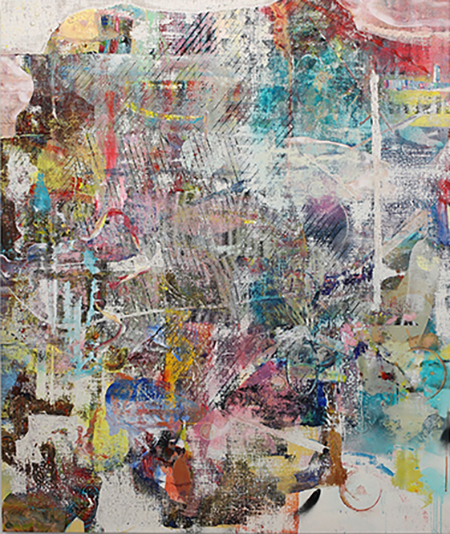 Liam Everett, "Untitled (Oraibi)," 2016, acrylic, enamel, alcohol and salt on oil primed linen, 85 1/2 x 72"
Quite notable is the artist’s bold and prodigious use of color. His palette spans the spectrum: brown, red, turquoise, yellow, etc. — sometimes muted, sometimes bright. The works are heavily layered, thick and thin, so one area of color may show through or be covered and then reappear, giving the work an atmospheric quality. But it’s all interspersed with moments of pop. The compositions are lively and keep the eye actively moving to a variety of jazzy rhythms. There is seemingly no end to what one could discover, so complex are these compositions, especially as you spend time to allow the layers to reveal themselves. Given that hazy atmospheric quality, the works tile towards a soothing meditative quality in spite of all or the visual activity. So well do they hold together, one may fail to recognize what a challenge making good abstract canvases is, especially paintings that have so much going on. Everett’s work hovers right on the edge of chaos without crossing it.